Angel Kitten has taken a 1 month vow of vegetarianism. I am so proud of her, I just cant even begin to tell you. She was so moved by information she found on the PETA website, that she took a pledge to be a vegetarian for a month. I think thats amazing, and I truly believe she will feel wonderful after that month is over – so much so, that may be it will inspire her to eat vegetarian once a week or so. We have had several discussions about the choice to live a vegetarian life. I dont really try and “convert” people, but I do strongly believe that living a life of love and gentleness often includes making a choice not to eat animals. However, I also believe strongly that if one chooses a carnivorous life, then thats OK too — especially if the choices about what meats one eats are made with care and forethought. For example, choosing to eat at the Golden Arches or the like, where the meat and chicken have lived largely painful lives, and been processed in a way that is wholesale, rather than respectful, is very different from choosing to occasionally eat meat that is free range and fed organic, non steriod, non hormone food. I would posit that the latter is much more delicious, even if much more expensive. I think if one wants to or has to eat a carnivorous diet, the logical, kind and respectful choice is to eat meat that has been treated with kindness and respect. May be not as often as highly processed meats and chickens, unless one is rich beyond the need to consider such things, but with much more satisfaction and enjoyment. Anyway, thats me off my hobbyhorse 😉 As part of my support of AngelKitten’s choice, I really wanted to make her food that will encourage her to see how satisfying eating a vegetarian diet is. This meal is one of her all time favourites, and we often order it in restaurants together, as a conglomeration of side dishes which we share. It could be completely vegan if you mashed the potatoes with olive oil instead of butter and cream… but I leave that choice to you 😉 For us, we used organic cream and butter and were very happy with that choice. 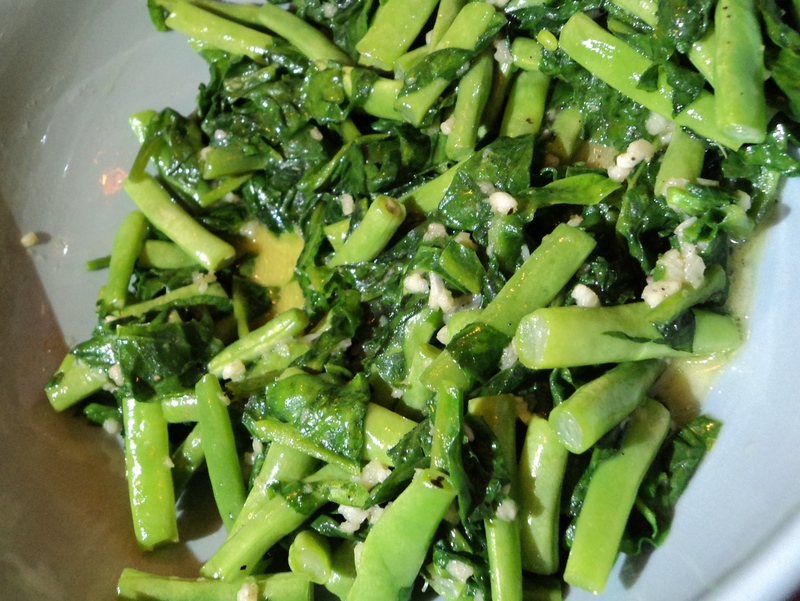 For dinner last night, we had sauteed spinach and french beans with garlic, roasted broccoli with soy and balsamic (which Ezril said tasted meaty and immensely satisfying), and mashed potatoes with roasted garlic. It was sublime. So simple, so easy, so delicious. It was ultimate comfort food for us, and got me to thinking about what comfort food really is. Its not fancy, overly thought through, complex food. Rather, its simple, well cooked, well sourced ingredients that are cooked so their essential deliciousness shines through. We used organic spinach, french beans and broccoli – and organic milk and cream in the potatoes. If you wanted more protein in this meal, you could add some toasted almonds to the vegetables, but I dont think its necessary. I think that if you eat a balance of food through a week or so, high in protein sometimes, high in greens others, youre fine. Balance is as much about listening to what your body wants and needs at a given time as following strictures and formulas. In a large saucepan or frying pan, over medium low heat, combine the olive oil and butter, and gently heat until the butter melts. Add 3 minced garlic cloves, and cook, stirring gently, until the garlic releases its unique scent, and goes glossy and soft. Add a bit of salt and pepper to the garlic, and toss in your prepared French beans. Stir the beans until completely coated with garlic and oil, and continue cooking until the beans change colour – they will go bright green. Taste and adjust salt and pepper. Throw in the spinach. Its OK if a little water still clings to the leaves, but you dont want the spinach to be soaking wet. I usually squeeze it to dry it, then chop it and add it to the pan. Stir until the spinach wilts and turns bright green, which should finish cooking the beans perfectly. Add the remaining 3 cloves of minced garlic, stir and taste for salt and pepper. Place in a large serving bowl, and set aside. Can be served hot or at room temperature. Its even delicious, in large spoonfuls, straight from the fridge. Preheat oven to 200C (400F). Line a baking sheet or pan with parchment paper. Place olive oil, balsamic vinegar, white wine vinegar, herbs, salt and pepper to taste and garlic cloves in a bowl. Toss to combine. Place the garlic on the baking sheet in a single layer, and pour over any remaining liquid. Roast the garlic in the oven until it is soft, burnt, glossy and slightly caramelised, about 20 minutes or so. Remove from the oven, and set aside. Peel and chop the potatoes roughly. Place in a large saucepan or pot, and just cover with water. Over medium high heat, bring the water to a boil, and simmer until the potatoes are soft. Depending on your potatoes, and how small the chop is, this will take between 20 – 40 minutes. Drain the potatoes, and place back in the pot. Slice butter over the potatoes, and pour over cream. 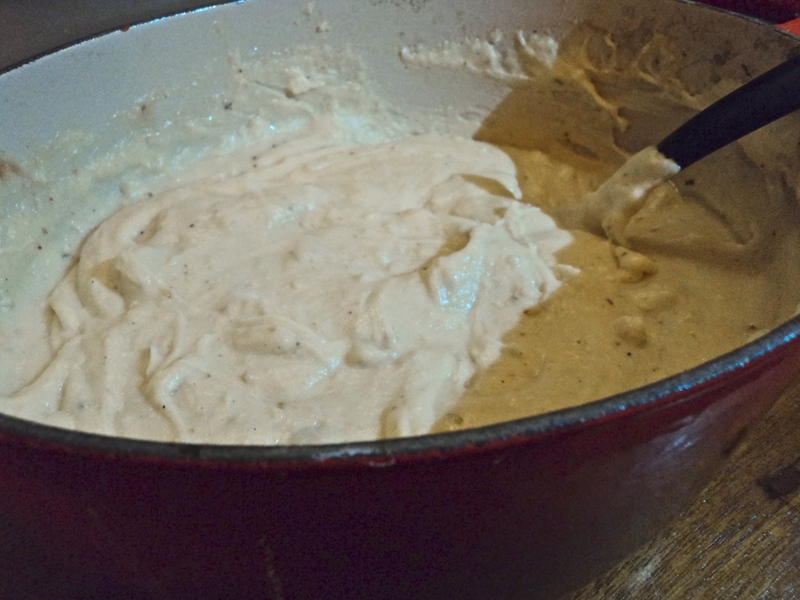 Using a hand masher, ricer, or immersion blender (as I do), mash the potatoes. Taste for salt and pepper, and adjust. Add all the garlic, and mash into the potatoes. Use a spoon or spatula to combine thoroughly, and taste and adjust for seasonings. This can be prepared a few hours ahead, and reheated over a very low flame. It can keep warm, covered for an hour or two. Combine the soy, balsamic, oil, and pepper in a large bowl. Toss in the prepared broccoli, and using your hands, toss well to combine. Taste the mixture and adjust seasonings if you wish. Place the broccoli in an even layer on the baking sheet and reserve any additional liquid for later. Roast in the oven for about 20 minutes. Remove, and flip each piece of broccoli over, dipping the broccoli in the remaining liquid. 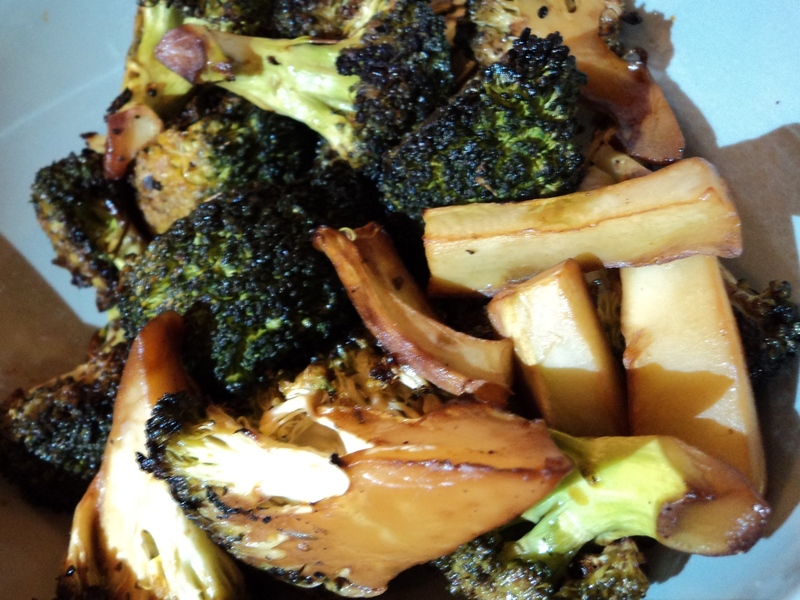 Pour over any additional liquid and continue roasting in the oven for another 5 – 10 minutes or until the broccoli is sticky, browny-green and delicious. Tomorrow we go to Whole Foods once again, but tonight was incorporate all the remaining handfuls and try and make something yummy night. This is one reason why I love phyllo dough. I am not a master Greekie cook (like my beloved Osisters – their spanakopita is phenomenal!) but I do like its ease of use, its pliability and its wonderful presentation. I dont know why, but people feel very manja-ed (Malaysian word – means spoiledbelovedcaredforlookedafter all rolled into one!) when you present them with a baked good – pies, tarts, pastries of all kinds. People love them, and the presence of a crust seems to elevate a rather normal meal into something special. On a night like tonight, phyllo dough enabled me to incorporate lots of things quickly and seamlessly… and delectably! I would never ever try and make my own phyllo dough. Its waaaaaay too delicate and intricate a process. Rather, I purchase the best phyllo I can find, and am thankful to those who take (almost) all the work out of it for me! There are a few general rules for working with phyllo. Use butter if you want a rich tart, and use olive oil if you want a slightly lighter version. Set up everything you need before you even begin to unwrap the phyllo because as soon as you do, you need to work quickly and efficiently. Phyllo will dry out or start to melt and stick together, so know what you want to do, and do it fast. And always try and work on grease proof or wax paper. This allows you to preheat your pan (I use a jelly roll or large flat cookie pan for this free form recipe) in the oven, and then slide your creation onto it, still on the wax paper. The bottom of the phyllo pie will be crisped because of the immediate contact with hot pan, and you wont get that soggy bottom which generally occurs when you bake the phyllo on a cold pan. And finally, try and drain as much of the moisture out of the filling as you can. You need some moisture to bind the vegetables, but dont put a very wet filling into the pie – it will leak and get soggy and be yucky. If you are making a vegan version, just boil all the juices down into a thickened sauce and use it in place of the ricotta and egg. I am going to tell you what I put into this pie, but really, use up what you’ve got in the fridge – from tomatoes and carrots to spinach and pine nuts. You will need about 4 – 6 cups of cooked filling in total. 1/4 cup crumbled feta (optional) – use toasted pine nuts instead if you are a vegan! In a large, non stick frying pan, heat the olive oil and saute the onions, garlic and sun dried tomatoes together until the onions are softened and glossy, and have browned a little. Add salt, pepper, oregano and paprika, and stir well. Chop the butternut quite fine – you want little cubes about the size of the nail on your pinkie. You want it to have body, but you want the butternut to cook quickly. Add to the pan, and saute for a few minutes, stirring constantly. Add 1 cup of hot water, and allow to bubble and cook for a while on medium high heat. In a separate small bowl, immerse the dried mushrooms in another cup of boiling water. Leave for at least 10 minutes, whilst the butternut is bubbling away. Once the mushrooms have softened, take them out of the water, and chop roughly, and add to the pan. Most of the water from cooking the butternut should have boiled away. Add about half a cup of the mushroom water, and allow to cook for a further five minutes or so. Taste and adjust seasoning. Sometimes I add a little cinnamon for depth of flavour, or more salt, pepper and spices. Turn off the heat (you should still have a significant amount of liquid in the pan), and transfer the contents of the pan to a sieve set over a small bowl. I usually use the mushroom bowl, cleaned out! Let the liquid drip through, and using your spatula or spoon, press down on the onion-butternut-mushroom mixture so that most of the liquid drains through. Reserve the cooking liquid, either to use as the base of a sauce for the pie, or as the binding liquid if you are baking for vegans. Transfer the mixture back to the pan, and over medium heat, add the spinach, beans, asparagus and artichoke hearts. Saute briefly until completely combined, but make sure that the greenery does not cook too long – you want it to retain its colour and taste! Tumble the vegetable mixture into a bowl, and set aside for at least ten minutes to allow it to cool. If you are cooking vegan, transfer the cooking liquid to the pan, and boil it down until reduced by at least half. It needs to be thick and syrupy. You could add some wine to this if you like, though I didnt have any available. Add a few tablespoons to the vegetable mixture to bind it properly, and give it some body. Otherwise, beat together the ricotta, eggs and feta, and mix gently through the vegetable mixture. Taste and adjust for seasoning, and set aside. Preheat the oven to 200 C and put a jelly roll or cookie pan into the oven to preheat. Lay out your work surface. On a clean tea towel or a strip of waxed paper, unroll your phyllo dough. Have a small bowl with olive oil and a pastry brush handy. Also have a small bowl containing your feta, and your bowl of prepared vegetables. Tear a strip of waxed paper long enough to fit your baking pan. Lay a phyllo sheet on the paper (my phyllo dough covered almost the entire paper), and gently brush with a bit of olive oil. Continue to layer leaves of phyllo dough, brushing each layer with olive oil. 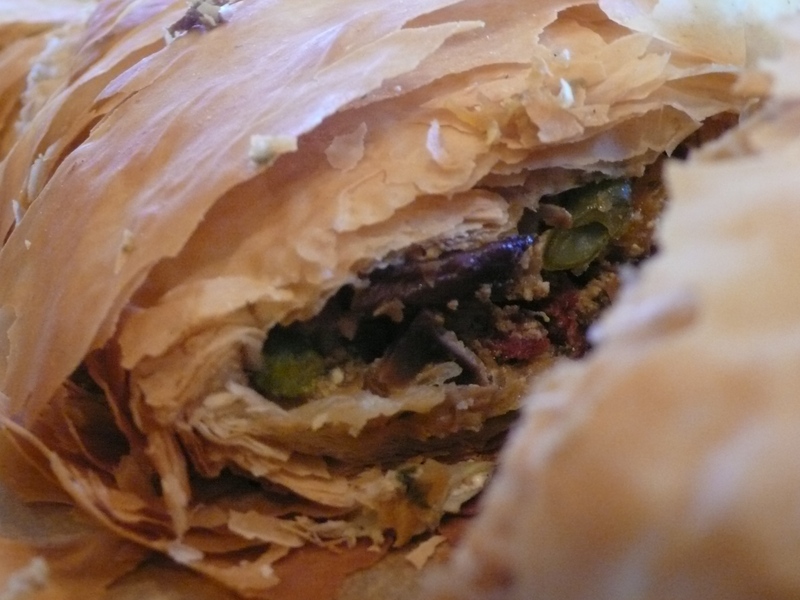 Its okay if the phyllo tears – just patch it up with olive oil, and keep going. You want to work quickly but surely, and dont worry about covering every inch of the pastry with olive oil – you really just want to give it a gentle brushing. I used 7 layers, but you can use as many as you want. Sprinkle your crumbled feta onto the dough, going straight down lengthways the middle of the dough. Leave a 2 inch space on either side. 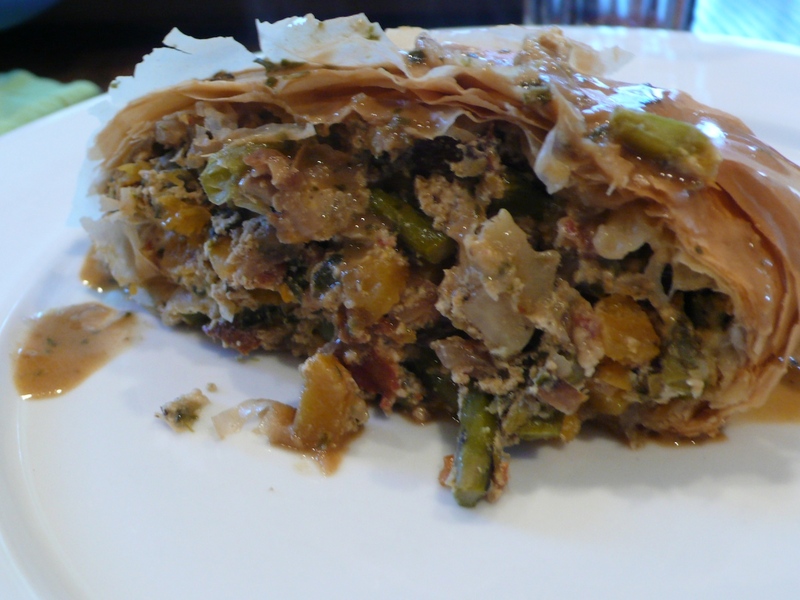 Spoon your vegetable filling over the feta, mounding it, and leaving space on either side. You will now have what looks like a log of vegetables centred on your phyllo dough. To complete the pie, fold over both short sides, like an envelope, and then fold the longer ends over each other. Using the waxed paper, flip the phyllo log over on itself, so that the seam is bottom side down. Centre the phyllo log on the waxed paper. Brush the top with olive oil. Using oven mits, take the hot baking pan out of the oven. Using the waxed paper, transfer the paper and the phyllo log onto the hot pan, and put back into the oven. Bake for about 25 – 30 minutes, or until the phyllo is browned and crispy. Let sit for a few minutes once out of the oven before slicing and serving. If you are not baking a vegan version of this, use the reserved cooking liquid as the basis for a lovely sauce to serve with the phyllo pie. I boiled the cooking liquid until slightly reduced, and then lowered the heat and added a few tablespoons of creme fraiche, a tablespoon of pesto sauce, some salt and pepper, and a few drops of balsamic. I whisked everything together, and served in a little jug to pour over. It was delicious!